A swamp is a type of wetland characterized by low, generally saturated land covered intermittently or permanently with shallow bodies of water, generally with a substantial number of hammocks, or dry-land protrusions, and covered by either aquatic vegetation or vegetation that tolerates periodical inundation. The water of a swamp may be fresh water or salt water. A swamp may or may not have peat accumulation (NRCS 2007), but is generally defined as having no substantial peat deposits (NSC 2005). In North America, swamps are usually regarded as wetlands dominated by trees and woody bushes rather than grasses and low herbs, while a marsh in North America is a wetland dominated by soft-stemmed vegetation, rather than woody vegetation (EPA 2004; NSC 2005). However, this distinction does not necessarily apply in other areas; for instance, in Africa swamps may be dominated by papyrus. Elsewhere, a swamp is distinguished from a marsh by being a wetland with more open water surface and deeper water than a marsh. Swamps provide innumerable values. They provide a habitat for a great number of flora and fauna, aid groundwater recharge and discharge and water purification, and add to the human wonder of nature. Nonetheless, they have often been looked at as useless wasteland and even as dangerous, spreading disease. As a result, many have been drained, diked, or otherwise altered worldwide, often to be converted to residential, industrial, or agricultural uses. Today, there is a greater awareness of their value and heightened protections of these unique areas. A swamp is a type of wetland. A wetland is a transitional environment between permanently aquatic and terrestrial environments that shares characteristics of both environments and where water, which covers the soil or is near the surface for substantial parts of the year, is the key factor in determining the nature of the ecosystem and soil. Although wetlands have aspects similar to both wet and and dry environments, they cannot be classified unambiguously as either aquatic or terrestrial (Barbier et al. 1997). In the United States, the four general categories of wetlands, according to the Environmental Protection Agency, are marshes, swamps, bogs, and fens (EPA 2004). The National Wetlands Research Center of the U.S. Geological Survey defines swamps as "forested low, spongy land generally saturated with water and covered with trees and aquatic vegetation; may be a deepwater swamp, such as the cypress tupelo, which has standing water all or part of the growing season or bottomland hardwood forests, which are only flooded periodically" (NWRC 2007). The Natural Resources Conservation Service of the United States Department of Agriculture defines wetlands as "an area of low, saturated ground, intermittently or permanently covered with water, and predominately vegetated by shrubs and trees, with or without the accumulation of peat" (NRCS 2007). A small swamp in the Hawkesbury River, New South Wales. The National Safety Council defines swamps as "a type of wetland dominated by woody vegetation but without appreciable peat deposits" (NSC 2005). However, although in North America swamps are usually regarded as including a large amount of woody vegetation (EPA 2004; NSC 2005; NRCS 2007), this definition is not universal. 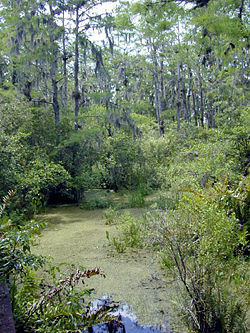 Swamps are generally characterized by very slow-moving waters. They are usually associated with adjacent rivers or lakes. In some cases, rivers become swamps for a distance. Swamps are features of areas with very low topographic relief, although they may be surrounded by mountains. Swamps are characterized by rich biodiversity and specialized organisms, such as frogs or the American alligator. A common species name in biological nomenclature is the Latin palustris, meaning "of the swamp." Examples of this are Quercus palustris (pin oak) and Thelypteris palustris (marsh fern). Swamps were historically often viewed as wasteland and were drained to provide additional land for agricultural, residential, or industrial usess, and to reduce the threat of diseases born by swamp insects and similar animals. Swamps were generally seen as useless and even dangerous. This practice of swamp draining is nowadays seen as a destruction of a very valuable ecological habitat type of which large tracts have already disappeared in many countries. The Tigris-Euphrates river system is a large swamp and river system in southern Iraq, inhabited in part by the Marsh Arabs. It was partly drained by Saddam Hussein in the 1990s in retaliation against the Shiite tribes' revolt against his dictatorship. Cypress swamp at Highlands Hammock State Park, United States of America. 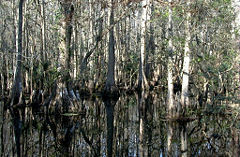 Among the most famous swamps in the United States are the Okefenokee Swamp and the Great Dismal Swamp. The Okefenokee is located in extreme southeastern Georgia and extends slightly into northeastern Florida. The Great Dismal Swamp lies in extreme southeastern Virginia and northeastern North Carolina. Both are National Wildlife Refuges. Another swamp area, Reelfoot Lake of western Tennessee, was created by the New Madrid earthquake of 1812. Caddo Lake, the Great Dismal, and Reelfoot are swamps that are centered at large lakes. Swamps are often called bayous in the southeastern United States, especially in the Gulf Coast region. Environmental Protection Agency. 2006a. What are wetlands? U.S. Environmental Protection Agency. Retrieved December 15, 2007. Environmental Protection Agency. 2006b. 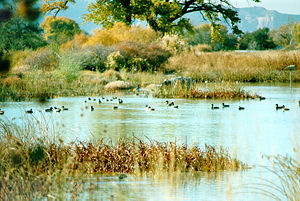 Wetlands definitions U.S. Environmental Protection Agency. Retrieved December 15, 2007. Environmental Protection Agency. 2004. Wetlands overview U.S. Environmental Protection Agency EPA 843-F-04-011a (December 2004). Retrieved December 15, 2007. Natural Resources Conservation Service (NRCS), United States Department of Agriculture. 2007. National Soil Survey Handbook: Glossary Of landform and geologic terms (Part 629) NRCS USDA. Retrieved December 15, 2007. National Safety Council (NSC). 2005. Swamp Environmental Health Center, National Safety Council. Retrieved December 15, 2007. National Wetlands Research Center (NWRC), United States Geological Survey. 2007. Swamp NWRC USGS. Retrieved December 15, 2007. This page was last modified on 2 April 2008, at 17:17.